The vibrant blue in the New Orleans street scene, painted by artist Vena, inspired the second-floor family room’s easy-going decor. 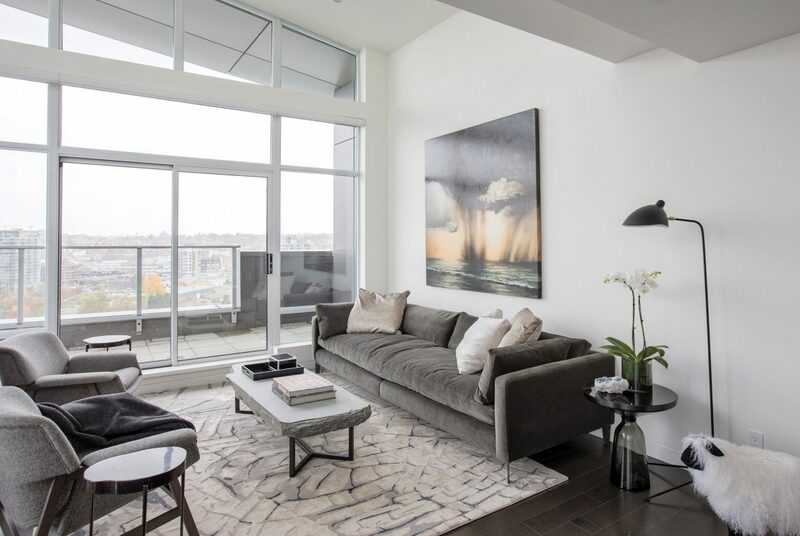 An 18th-floor penthouse in a coveted neighbourhood. 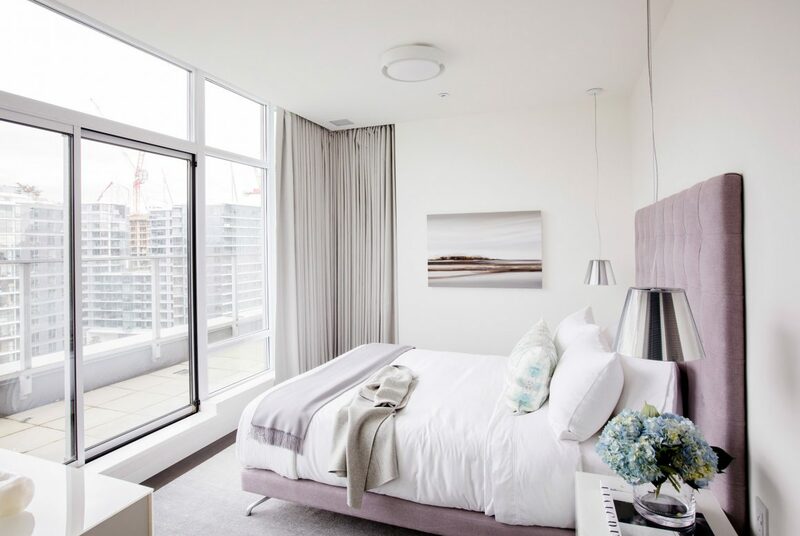 Windows that extend 12 feet from floor to ceiling, the better to enjoy an enviable panoramic view. What more could anyone want? 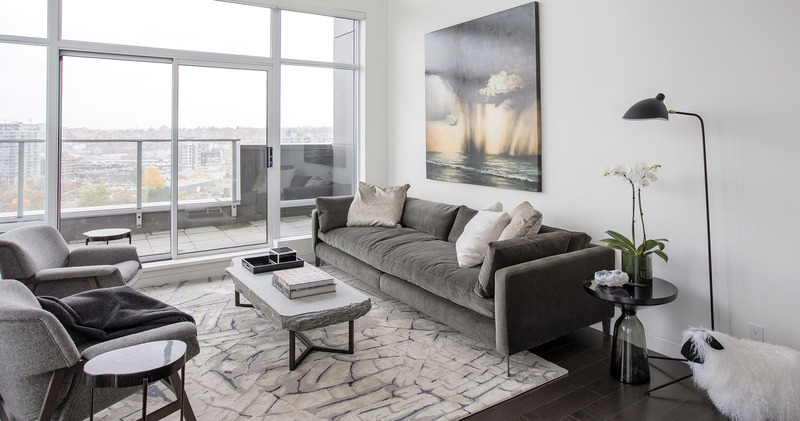 Much more, it seems, for the owner of this Marinaside-area condo. Especially since renovating and building projects is the main business of Al Dietrich of Reotech Construction. To entertain clients, there had to be a level of sophistication in keeping with the upscale area. But it was also to be a home for him and his wife Cindy. 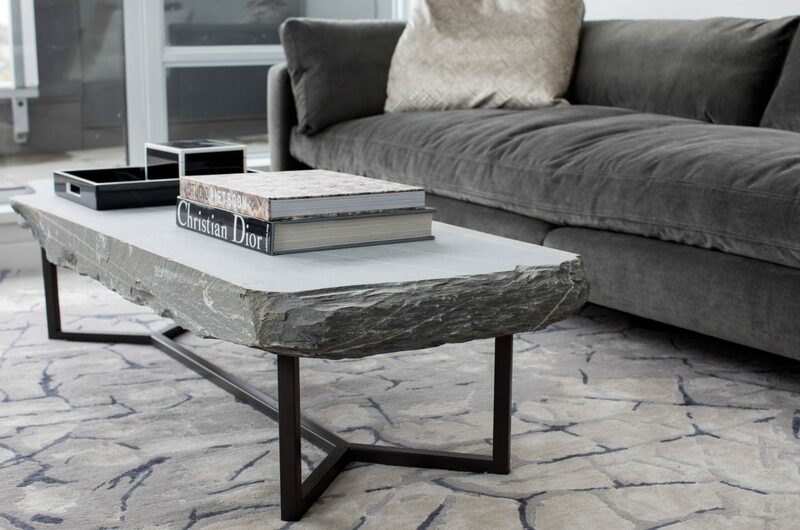 The living room coffee table was designed and crafted by Medina Design House of metamorphic slate from Vancouver Island. 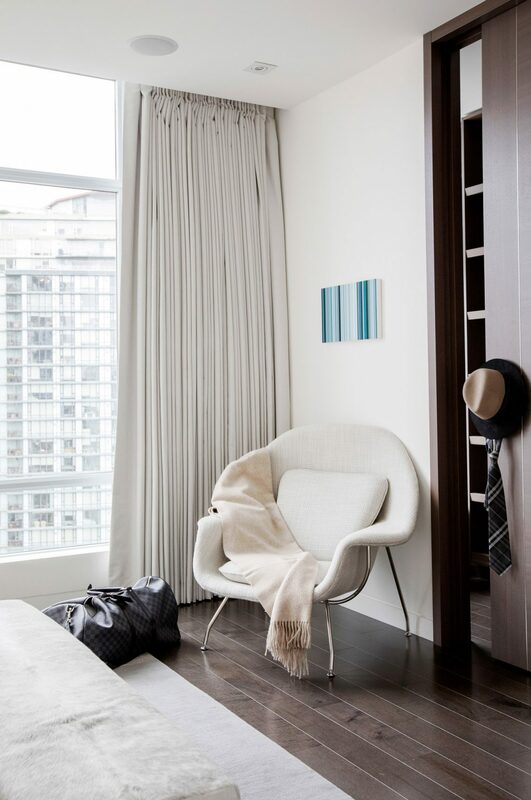 “Our challenge was to give the home some personality, reflect what makes them unique, while keeping a highly contemporary, minimalist look,” says Erica Schmidt, designer and partner at Medina Design House, who designed the home’s interiors with co-designer Ivan Quintana. 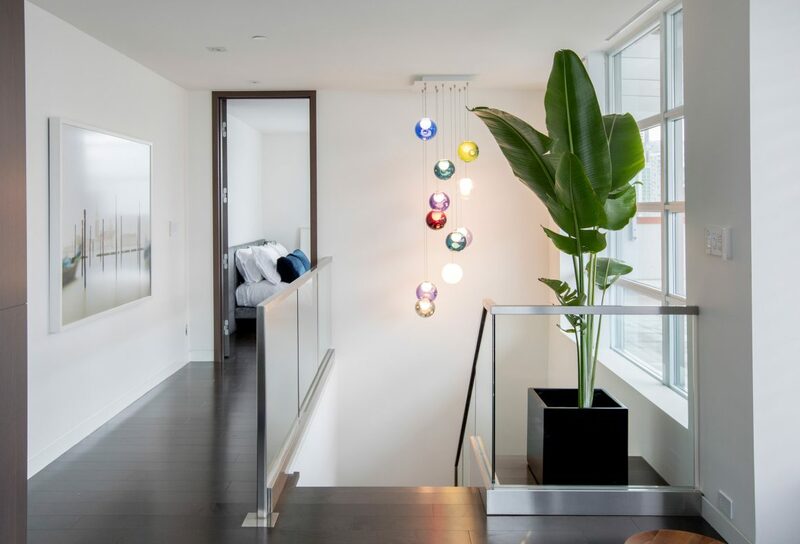 The owner had his teams completely gut both floors of the 1,950-square foot condo. Almost nothing was kept from the original 2007 floor plan. Exterior walls were stripped back to the concrete and interior ones shifted, the three bedrooms and bathrooms were relocated. Ductwork was moved to extend ceiling heights. Only the kitchen remained in the same area because of the plumbing. 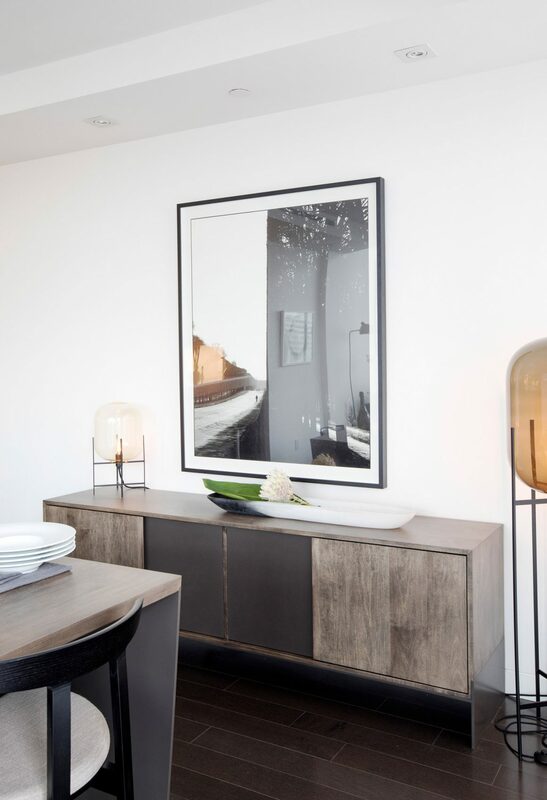 Dining table and credenza: designed by Medina Design House and fabricated by Jamie Douglas of Douglas Solutions in collaboration with Fine Line Metal. Framed photograph: Walking Man, Versailles, France, from Captured 52 Photography. What went in: Dietrich wanted the very latest technology, in particular a very sophisticated smart-home system. From music to ambient temperatures to lights to security, everything can be regulated from a smartphone. All kitchen appliances are state-of-the-art as well. Custom millwork was installed throughout and a grand open staircase connects the two floors. A more sophisticated and formal approach was taken in the living room. Furniture was chosen as the defining element for the living room on the main floor. Open to both the kitchen and dining room, it is where Al and Cindy entertain the most. 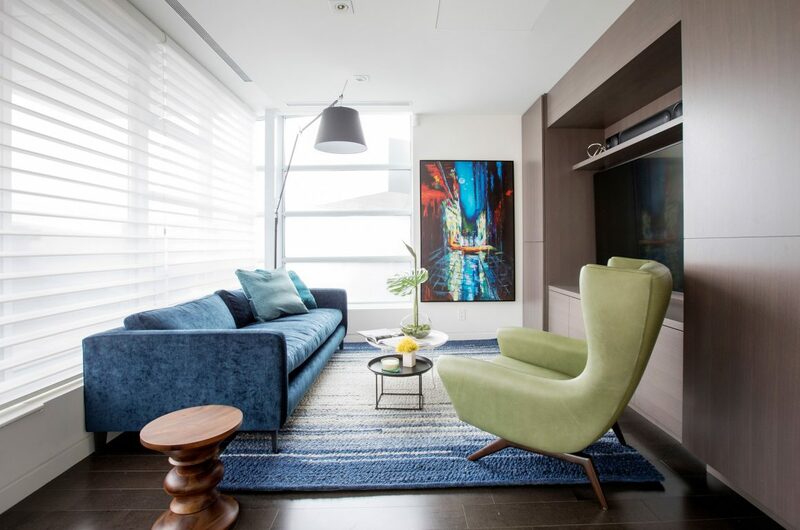 Focal is a 113-inch low-slung contemporary sofa that had to be custom-made in two pieces to fit into the elevator; it takes pride of place against one wall. In front of it sits an imposing coffee table, designed by Medina Design House, crafted of a rough-hewn slate slab mined on Vancouver Island. Italian black marble facing on the fireplace adds impact. 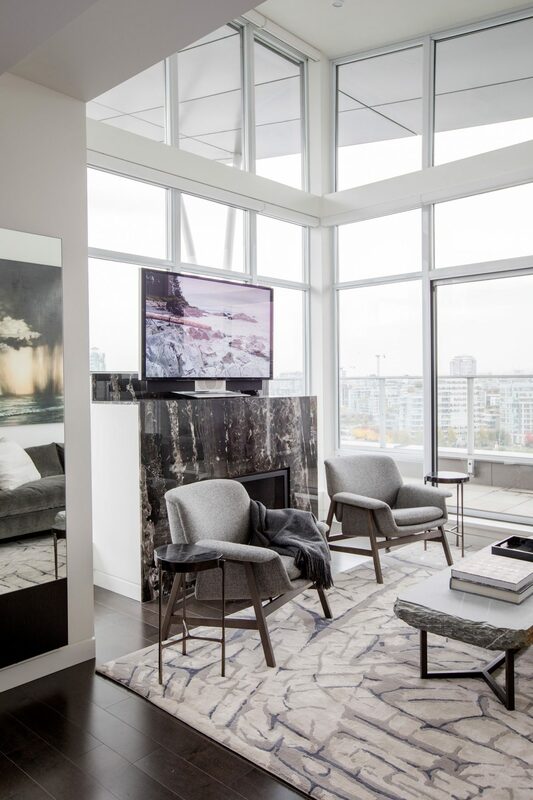 Walls were kept white so as not to detract from the amazing views of the city; they contrast with wide-planked maple hardwood with a dark stain. “In such a large space, we felt it was important to select elements that had a presence without overwhelming or making it feel smaller,” says Quintana. In the master bedroom, Rising Moon Maui, a photograph by David Burney, is positioned above the bed. A very personal work of art served as the design inspiration for the second-floor family room. The couple refer to it as the “Blue Room” after the painting by artist Vena that they purchased while strolling along a New Orleans street. The room is intended to be an informal space, where younger family members can feel comfortable. Off of it is the 850-square-foot patio that boasts panoramic views and a hot tub. One of two guest bedrooms is also located on the second level. 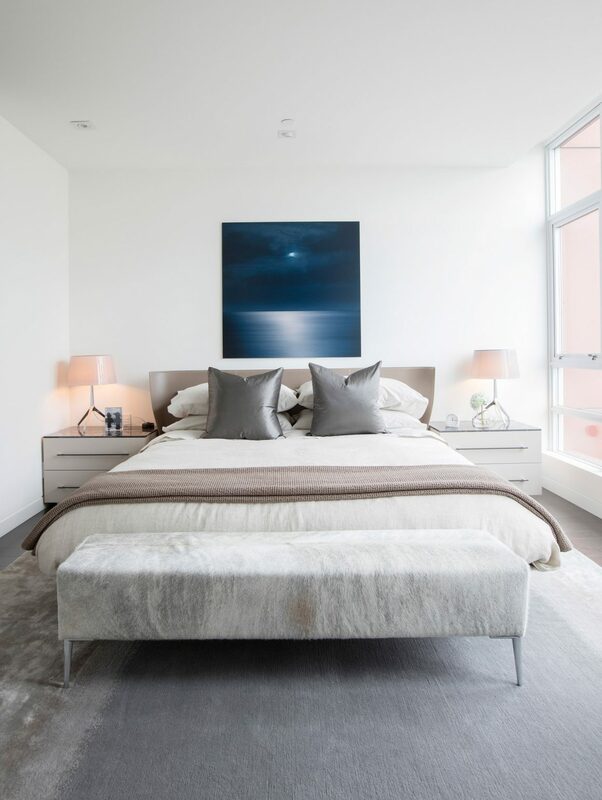 The painting in the guest bedroom, is a landscape (oil on canvas) by Zoë Pawlak. For the main-floor master bedroom, the designers took their cues from a work by Richmond photographer David Burdeny called Rising Moon Maui. The duo found an Italian-made bed with the right lines, then designed custom cabinets to flank it, and topped them with the same granite that was used on the fireplace. Cindy had wanted a cowhide rug, but the black-and-white colour didn’t fit the subdued palette. Schmidt proposed an ottoman covered with cowhide, dyed in a soft grey to harmonize with the wood, an original solution the clients loved. Hallway painting: Forces of Light and Dark (acrylic on canvas) by Sasha Rogers. But it wasn’t only big-picture thinking for the designers; the finer details were also important. They chose everything from wall sconces and bathroom mirrors with embedded lighting to hand soaps, towels and bed linens.